Victoria’s Banyule City Council are currently reviewing a development application for a mixed-use commercial and residential building intended to help support the growing action within the Ivanhoe Activity Centre. The proposed development, located at 40 Upper Heidelberg Road in Ivanhoe, was brought to council by SB&G Group and designed by John Demos Architects. The building, as it was proposed to council, consists of a publicly accessible piazza, two commercial and retail spaces at ground and mezzanine levels, five residential levels which present as the primary built form component, and two recessive levels above said built form. The site is located at the southern edge of the northern part of the Ivanhoe Activity Centre, 10 kilometres to the north west of the Melbourne CBD. The site is positioned at the crossing of Upper Heidelberg Road and the Hurstbridge and South Morang rail lines resulting in a triangular shaped site, approximately 2,500 square metres in size. 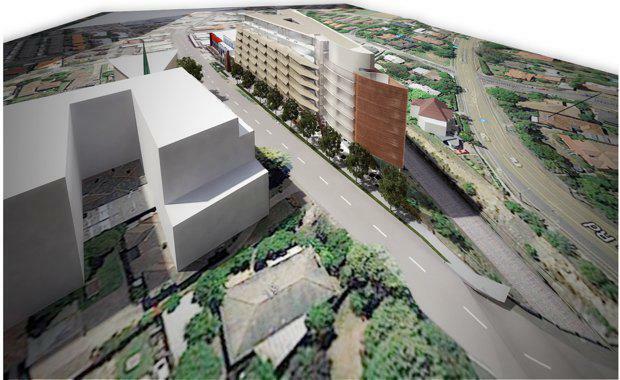 According to John Demos Architects, 40 Upper Heidelberg Road will provide 180 car parking spaces, 15 motorcycle parking spaces and 150 bicycle spaces spread across a five-level basement. On the building’s ground level, there will be 450 square metres of commercial office space as well as 270 square metres for café facilities. There will also be 1,180 square metres of public use plaza, with pedestrian entrances, lifts and a lobby area. The development's entire structure is elevated 7.29 metres off the ground which creates a space that will accommodated the proposed café and dining features. 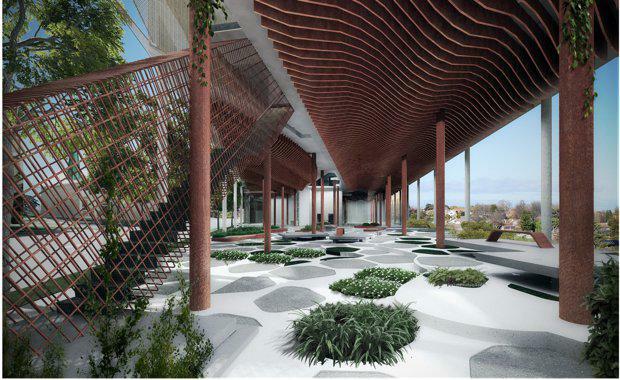 The developers have also envisaged the space to cater for health, wellbeing or arts-focused tenancies and feature a publicly accessible landscaped piazza and a landscaped atrium for the building’s residents. Above the ground level piazza, the building's five residential levels are expressed in two “modules”. The northern module, which spans two-thirds of the site’s frontage, features a modulated front façade line of balconies and windows enclosed within a brass veil that curves up the height of the building to create a light-weight sculptural quality. This veil features cut-outs and projections to create visual interest whilst providing privacy measures to the building’s residents, daylight access and screening, and natural ventilation opportunities. 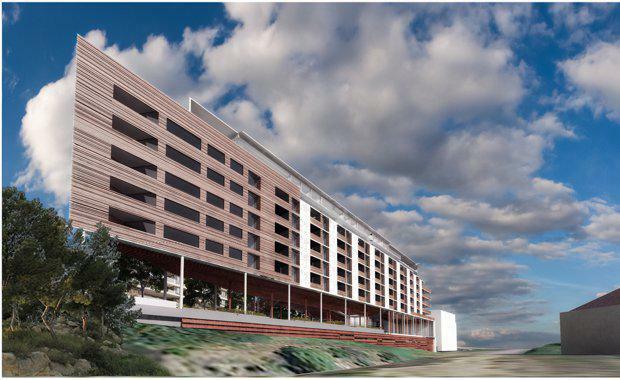 The proposal said that the ‘crown’ of the development will incorporate two residential levels. "The built form will be recessed from all boundaries to reduce the visibility of the built form, and finished in zinc cladding and glazing to appear as a recessive and light weight feature." According to SB&G Group's application, Melbourne as a city is now in an advanced phase of development and is undergoing substantial change and evolution across the board. "In the face of sustained and record population growth through the 21st Century, the challenge for planning policy at both local and state has been to deal with this growth in an appropriate way," they said. "Growth has outstripped population projections associated with recent planning documents Melbourne 2030 and Melbourne @ 5 Million. Plan Melbourne now envisages a city of 8 million people by 2050, with the northern sub region anticipated to accommodate an additional 400,000 – 470,000 people just to the period to 2031. "To deal with this the new metropolitan strategy places a significant emphasis on Activity Centres and Urban Renewal Areas to do play a significant role in terms of the ‘heavy lifting’ in providing new, transit and employment oriented housing supply. "According to the developers, 40 Upper Heidelberg Road has the potential to deliver a “gateway” response celebrating the start of the Ivanhoe commercial strip and an urban built form outcome that anchors the Ivanhoe retail strip, strengthening its role as an activity centre. "The landscape character of this development responds to the village character of the surrounding communities and the rich and layered history provides opportunities to celebrate its character through planting, materiality, circulation and form. The Landscape Concept Design envisages outdoor seating/dining opportunities along the edges of the public spaces with the main event/gathering/communal seating spaces located towards the centre of the site. "This creates an opportunity for a weekend market concept, ‘pop-up’ and cultural events, using the plaza space, the catenary ‘ceiling’ and building program to facilitate programmed events and community engagement. "The public domain is generally paved, with feature inlays and materials responding to the distinctive character of the individual spaces with trees and low planting. Street trees are proposed down the length of the road to create a strong visual link through the space to the central plaza, as well as provide amenity, shade, and wind protection. These trees will be supplemented by low planting to help define different spaces and provide visual points of interest. "The design creates permeability from the street and other major spaces within the site, but ensures spaces are defined and have a distinct character to allow wayfinding and pedestrian comfort. 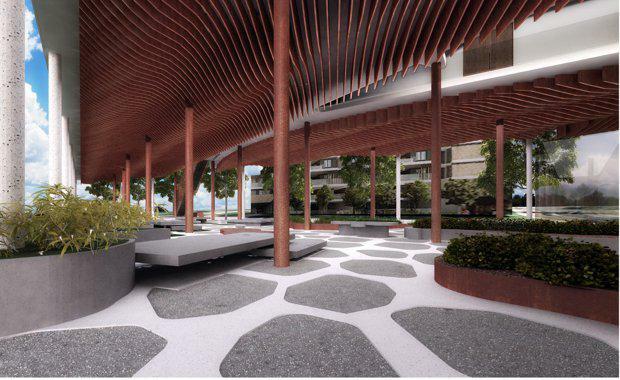 The central plaza space will provide a light open canopy to provide shade and assist with wind amelioration. These spaces will also contain low level planting and high quality paving materials with clear pedestrian circulation. "This is a place where people will want to sit and enjoy breakfast, lunch or dinner or just sit and enjoy the ambience. Lighting will be supplemented with feature landscape lighting and will become the public ‘heart’ of the community. "SB&G Group's 40 Upper Heidelberg Road is currently in the community consultation stage of its application process, and Banyule City Council is currently accepting submissions until July 4, 2017. 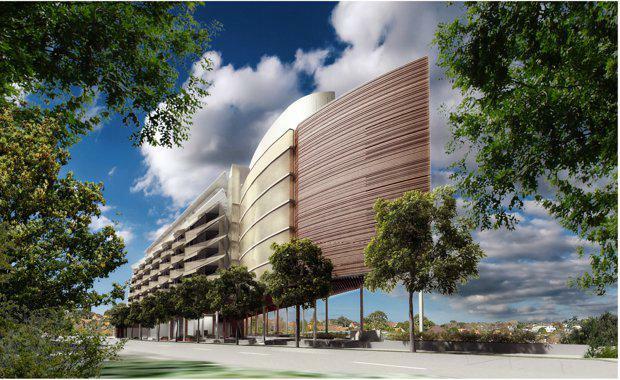 Images courtesy Banyule City Council and John Demos Architects.